Being waterproof and even impermeable to oil or fat, Coverplast® Barrier Waterproof Plasters are ideal for wet or moist working conditions, helping to provide an effective bacterial and viral barrier so as to reduce the risk of secondary infection. The plasters have good and lasting adhesion to skin with a wide, all-round adhesive margin that allows for washing and bathing without compromising on protection where there is an increased risk of secondary infection. 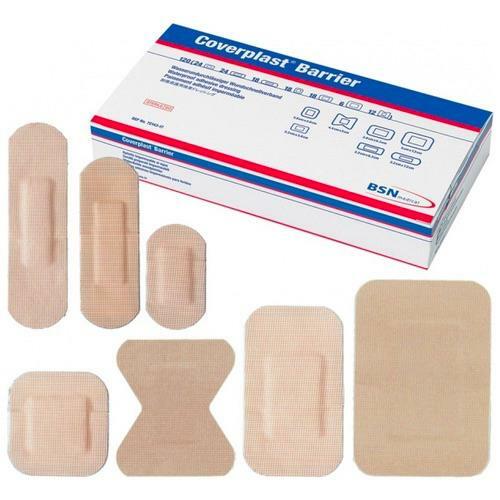 The plasters have a microporous structure that allows the skin to breathe, helping with the healing process, and a skin-friendly acrylic adhesive that is highly comfortable. These waterproof plasters are highly recommended for everyday minor injuries an ideal addition to any first aid kit, whether at home, in the workplace or even on the road. Available are a wide range of sizes and shapes of plaster, however the assorted pack of 120 plasters specifically provides a range of different sizes to suit any emergency. To find out more about the sizes and shapes available, take a look at the full list of packs available above.